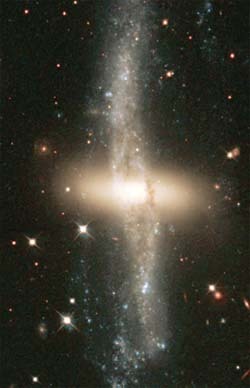 What is a peculiar galaxy? A peculiar galaxy is a galaxy that could probably fit into one of the other general categories of galaxies—elliptical or spiral—except for some kind of peculiarity. Some examples include a long tail of stars, an unusually shaped disk, a second bulge, or even a whole other galaxy overlapping it or crashing into it. Many peculiar galaxies look the way they do because they are in the process of colliding, interacting, or merging with other galaxies.